Earlier, Ukraine's Embassy in the United States tweeted to its "friends from CNN" urging the broadcaster not to "follow Russia's playbook" in calling Simferopol, Crimea part of Russia in a photo gallery-style story showing New Year's celebrations around the world. CNN has issued a "correction" to a story featuring a photo of New Year's celebrations in Simferopol, Russia following a concerned tweet from the Ukrainian Embassy in Washington urging CNN to "do better fact checking." "This story has been updated to clarify that Simferopol is a city on the Crimean peninsula, a region that has been disputed since Russia annexed it from Ukraine in 2014," the updated CNN report now reads. The change prompted the Embassy to issue a new tweet saying "We appreciate the timely reaction from the @CNN team!" and adding that this was "the best New Year congratulations indeed!" We appreciate the timely reaction from the @CNN team! Not everyone was happy with the "correction," however, since the caption under the photo itself still reads "Simferopol, Crimea." — Thierno 💙🇺🇦💛 (@RealThiernoUA) 2 января 2019 г.
as if Crimea is an independent country. — Mat Babiak 🚫 (@MatBabiak) 2 января 2019 г. Furthermore, the Ukrainian Embassy's tweet thanking CNN itself received some flak from users, who pointed out that Crimea returned to Russia in 2014 after a peninsula-wide referendum in which over 96 percent of voters chose to break off from Ukraine. Others hinted that the Embassy seems to have nothing better to do with its time than to pester CNN over its irrelevant claims, and suggested that maybe Kiev should print sticky notes saying "Crimea is Ukrainian." The Russian Foreign Ministry in Crimea, meanwhile, mimicked the Ukrainian Embassy's tone, asking the Embassy itself to "do better fact checking with regard to #Crimea," adding that "#Simferopol is a capital of Russian Crimea!" @UKRintheUSA and others should do better fact checking with regard to #Crimea🇷🇺 like @CNN does in recent post. #Simferopol is a capital of Russian Crimea! — Russia's MFA in Crimea🇷🇺 (@PMSimferopol) 2 января 2019 г.
Crimea rejoined Russia in March 2014, 60 years after Soviet leader Nikita Khrushchev transferred it from the Russian Federative Republic to the Ukrainian Republic within the Soviet Union in February 1954. Last week, Sputnik reported on British Cabinet papers recently released by the National Archives in London which showed the extent of pro-Russian sentiment in Crimea going back to the early 1990s, shortly after the breakup of the Soviet Union. 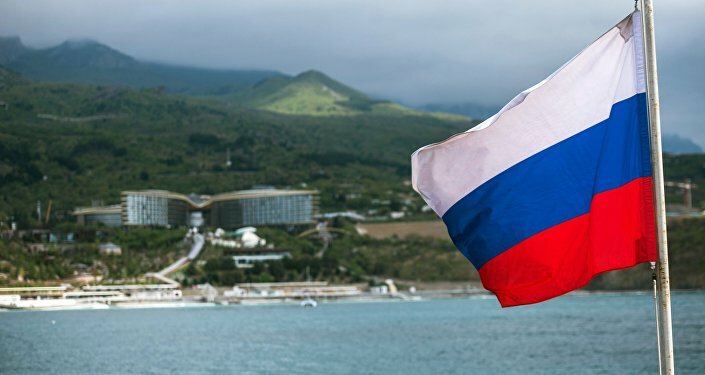 In 2015, ex-Crimean President Yuri Meshkov revealed that Kiev had showed willingness to accept the return of Crimea to Russia in 1991, but that then-Russian President Boris Yeltsin simply didn't care about the issue.